With this news, you can't lose! Boat Skills – Man Overboard! A great deal gets written and said about what to do in a man overboard situation and I’m not going to sit here and say that any of it is wrong – but we certainly shouldn’t take it as “the law” when an instructor or skipper opines that theirs is the “right” way. Perhaps therefore it’s sensible for us to have some sort of framework that we can use as a test for how well a given methodology might work? These are the questions that I ask myself when I’m evaluating an approach and whilst they’re probably not exhaustive they do at least mean that I can create a level playing field upon which to examine the various game-plans. 1) Is it applicable to my vessel? As with most of these questions this seems kind of obvious, and yet we must be savvy enough to ensure that our methodology is re-evaluated every time we switch ship. Clearly a method that will work perfectly aboard a superyacht equipped with a powerful RIB may not be appropriate for a 22 footer cruising the Solent but what seems like a minor change to a boat’s gear can lead to an important change in Standard Operating Procedures (SOPs). An example of this would be when we were required by our surveyor to secure Amelie Rose’s tender to her deck in order to use it as stowage for her spare liferaft. The time to deploy her dinghy went from approximately 3 minutes to over 10 minutes and meant (to my mind at least) that we could no longer utilise the dinghy as part of our standard MOB drill. Another example would be any method that calls for the crew to fill and spill the mainsail by grabbing the “falls of the mainsheet”. This will be useless on any mainsail driven sloop in excess of about 12 tons and doubly useless on anything that size with a gaff main. Unless you sail with gorillas I guess. 2) Is it safe for those on board and does it keep the risk to the casualty to a minimum? Any method which inherently increases the risk for those on board or puts the casualty in even more danger needs to be weighed very carefully against whatever advantages in terms of speed or simplicity it may bring. For example, there’s a method that calls for gybing into hove-to which can bring the boat very swiftly back to the casualty (inside a minute on a modern yacht). However the helm needs to make a rapid assessment of the dangers of doing so; is anyone in the way of the boom, is the mainsail sufficiently sheeted in etc? I’m not sure that the pressured situation of a sudden MOB call is the best time to be trying to weigh up these factors. A further example is any methodology that brings the boat alongside the casualty bows first, with the helm completely unsighted in the final moments before contact is made, just as the yacht slows down and steerageway is lost. The shallow stem of a modern yacht bouncing up and down in proximity to the casualty’s head just as the yacht begins to pay off is the stuff of nightmares. 3) Will it (nearly) always work? I am lucky to spend lots of the early Spring and Autumn bobbing around in the Solent – nearly always with two or three school-boats within sight. So I get to see quite a number of MOB drills and am often surprised to see how rarely the exercise is initiated from any point of sail other than close hauled. Maybe the stats inform us that this is when the majority of MOB’s happen – but I think not. I suspect that there are a fair number of Day Skippers and even Yachtmasters out there who have never tried to do an MOB exercise from a dead run. So maybe we should ask ourselves will our “just tack onto hove-to in order to stop the boat” method always work? Heaven forbid we’ve got the spinnaker aloft! The less time that the casualty spends in the water the more likely it is that they will still be alive come closing time. Enough said. Almost. Any skipper reacting to the “MOB on a dead run with the kite up” scenario above who doesn’t reach for the riggers knife clearly values their gear too highly or human life not highly enough. 5) Is it easy to brief? For me this is as important a question as any of the others. Sods Law dictates that when your first mate trips up and goes headfirst into the oggin you’ll be down below attending to chartwork or, uhm, some bodily function or other. Your weakest helm will be on the stick and every second counts. How well this plays out will come down to how well briefed your crew are and how easy they find it to follow your SOPs. Methods with multiple decision branches e.g. “if the engine starts then do x but if it doesn’t do y” cause problems here because your average panicked helm is going to get mixed up. Remember, most of us can only keep between 2 and 5 things in our minds before the excess starts to overflow so whatever method you choose needs to be simple, memorable and preferably should have less than 5 steps. So there’s my framework. As I said, none of it’s brain surgery, but it allows me to make up my mind about an MOB strategy when I climb aboard a new vessel and either read her SOPs or have to establish some for her before we start a voyage. But what about Amelie Rose? What do we do? Well this method was taught to me when I did my Yachtmaster Instructor course back in 2013. First person to spot the MOB shouts “Man Overboard” and points at the casualty. Keeping track of the casualty by pointing at them is now their task until contact is re-established. Helm brings the boat onto a BEAM REACH and continues for TWO BOAT LENGTHS. If anyone is free to do so a Mayday should be issued, the MOB button on the chartplotter should be pressed and the engine started. Helm TACKS into HOVE TO. If it hasn’t been already the engine is started and checking carefully for ropes in the water engaged IN REVERSE. Helm uses the engine in reverse to check the boat’s forward progress in hove to, causing the vessel to slide sideways and bringing the casualty back into contact with the vessel amidships. Occasionally over-enthusiastic braking will require a touch of forward to ensure that the casualty is picked up amidships. Casualty is recovered at the chainwalls (where the shrouds connect) if necessary using the topmast backstays to pull them out. Should the engine fail to start the procedure is identical, as often the helm will be able to bring the vessel close enough to recover a conscious casualty using the throwing line and harness – but in any case the vessel is now positioned in an ideal place to attempt a pickup under sail having had chance to deploy the man overboard gear. In this instance the following steps are inserted after Step 3. Let the headsails draw, Helm proceeds on a BREAM REACH (half way between a broad reach and a beam reach!) for 8-10 boat lengths. TACK onto a fine reach back to a point 1-3 boat lengths (depending on the weight of the boat) to leeward of the casualty checking to make sure that the wind can be spilled from the main sail if the head is brought up to point at them. Having established this there is no need (on Amelie anyway) to re-sheet the main, there will be enough drive in it if you resume your course. As the casualty appears abaft the shrouds push the boats head toward the wind bringing the casualty alongside the leeward chainwall. Recover the casualty as in Step Five above. How does this method do against my rules? Well in Amelie’s case absolutely – but I’d hazard a guess that any sailing boat up to 70 odd feet that will heave to reliably would have some success with this. (Boats that aren’t stable in hove to may struggle as any prop kick upon engaging reverse may knock the boat out of hove to). 2) Is it safe and does it keep the casualty’s risk to a minimum? This is a strength for this method I believe. There’s no gybing and the sails are not left flapping as we motor to windward toward the casualty from a downwind point. Furthermore the helm keeps visual contact with the casualty until the very last second (or even until contact in a yacht with low freeboard). At no point is the casualty anywhere near the bow. In teaching this to both Comp Crews and Day Skippers I’ve never had the “by engine” method fail, once they’ve had a couple of goes to get the hang of it. With a simulated engine failure the method is at least as reliable as any other I’ve tried. Furthermore the technique is identical whatever the initial point of sail the boat is on as the first step for the helm is to bring the boat to a Beam Reach. One time that it won’t work is when there is no wind of course, in which case there is little option other than simply to drive back to the casualty and stop next to them. Well nothing happens all that quickly on the Amelie Rose, but on average a Day Skipper trainee will be picking up the casualty, reliably, in 3-6 minutes using the engine method after a couple of tries. As per 3) under sail is more of a moveable feast – but again no worse than any other method I’ve seen. 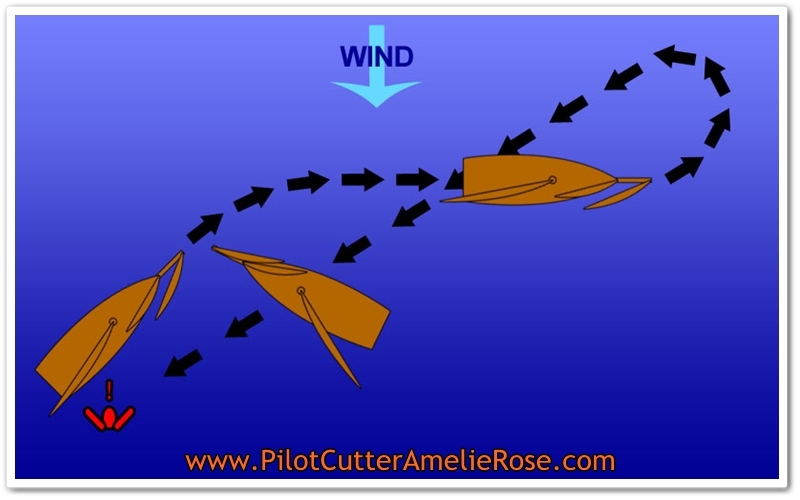 This is the most powerful upside to this method as the helm only needs to remember 3 things (assuming that you’ll be back on deck by the time you discover that you have an engine failure). All they need to learn is, BEAM REACH for 2 boat lengths, TACK onto HOVE TO, use the ENGINE IN REVERSE to bring the casualty alongside. There are no decision trees, no IF THEN ELSE statements and no confusion as to what to do. So what about you? How do you do your MOB drill? I’d definitely recommend that you have a stab at applying these rules and see whether your plan holds up. Oh and remember what they say about plans never surviving first contact with the enemy. If it’s all in your head, get it out, get it briefed to your crew, and get it practiced! If this has whetted your appetite for training or you’d like to experience our methodology “for real” then this approach is taught on all of our courses so check out the dates and come along. Nick is also available for “own-boat” tuition if boat handling is giving you nightmares or you just fancy a bit of advice on how you’re doing. On doing my Yachtmaster Instructor Update last year it was pointed out that the “BREAM Reach” element of the enginless pickup may actually put the boat too far to leeward of the casualty – which may (especially in a modern boat) mean that the return leg is close hauled rather than a fine reach. This is due to the way that the boat’s forward motion drags the apparent wind forward. I.e. When the boat appears to be on a Beam reach the TRUE wind is actually already abaft the beam so you are actually on a BREAM Reach already. With Amelie Rose’s low aspect mainsail (very difficult to spill the wind entirely) this is actually a bonus (although it leaves very little room for error), but on more modern boats a pickup under sail can be done by simply sailing away on a BEAM reach and then tacking which will actually bring you back onto a FINE reach, which with the high aspect main will probably be enough to let the wind spill if you sheet out. Want to do RYA Coastal Skipper on a Proper Boat? Topsail Adventures Launches New Website! A Paimpol Palaver – Chant de Marin hits 30 ans! It couldn't be simpler, just fill in the form and click subscribe. Post: Amelie Rose, Harbour Office, Bucklers Hard Yacht Harbour, Beaulieu, Hampshire, UK. SO42 7XB. Site design by Topsail Adventures Ltd. © 2019 Topsail Adventures Ltd.